Their ‘secrets’ are very simple. Building your business starts with setting goals and creating a plan! When it comes to business and talking about goals and business plans, strategies, it sounds a bit daunting. To be honest, it doesn’t have to be. If it can be done on one page and in the time it takes to have your morning coffee, what’s stopping you? We’d like to share with you our one page business goal setting sheet. It’s quite simple. Download the image, print it out and fill in the blanks. Use the white space to make notes and write down actions that need to be done. This same template can be used to set your overall goals for the year and then used again to break down the goals into months or weeks. 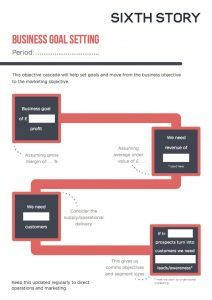 The flow of business goals in turnover and profit to how many customers you need (operations) leads to your comms objectives. Once you’ve fill out your sheet, keep it pinned up near your desk when you can review it everyday and stay focussed.